Straddling the border between France and Spain, Basque Country is but a small corner of Europe, yet it offers a glimpse into the language, people and territory that are deeply interwoven with the origins of European culture. The ancient land of the Basque climbs north from the Bay of Biscay into the Pyrenees Mountains, and the settings for this journey are spectacular: ranging from classic seaside villages to mountain passes. We sample both the French and Spanish territories during this trip, marveling at the beautiful landscapes unique to each. Awaiting us is traditional Basque cuisine, which is influenced by both fisherman and shepherds. Seafood, farm-raised meats, expertly aged cheeses, hearty soups, peppers of all varieties, sweets and delicate confections: all reflect the subtle flavors of Spain and France, land and sea. And nothing could be more satisfying than pairing Basque dishes with the region's renowned con cuerpo (full-bodied) wines. As every Basque will tell you: "To know how to eat is to know enough." So as we eat heartily, we will come to understand and love the Basque culture. Straddling the border between France and Spain, Basque Country is a small corner of Europe, yet it offers a glimpse into the language, people and territory that are deeply interwoven with the origins of European culture. The ancient Basque land climbs north from the Bay of Biscay into the Pyrenees Mountains, and the settings for this journey are spectacular: ranging from classic seaside villages to mountain passes. We sample both the French and Spanish territories during this trip, marveling at the beautiful landscapes unique to each. Awaiting us is traditional Basque cuisine, which is influenced by both fisherman and shepherds. Seafood, farm-raised meats, expertly aged cheeses, hearty soups, peppers of all varieties, sweets and delicate confections: all reflect the subtle flavors of Spain and France, land and sea. And nothing could be more satisfying than pairing Basque dishes with the region’s renowned full-bodied wines. As every Basque will tell you: “To know how to eat is to know enough.” So as we eat heartily, we will come to understand and love the Basque culture. Our group will meet in Bilbao, Spain, and drive to the Bay of Biscay, where we’ll walk from village to village along a coastal stretch of the Camino de Santiago. Once used by medieval pilgrims on their way to Santiago de Compostela, this trail crosses vineyards growing Txakolí, a grape used to make the crisp, white “wine of the sea.” For lunch, we’ll sample seafood pintxos (similar to tapas) in San Sebastián. On Day 2, we’ll explore lovely French Basque villages and hike through scenic hills and Basque farmlands to Espelette, the capital of spicy red peppers, a cornerstone of Basque cuisine, especially the famous Piperade dish. We drive over the Western Pyrenees back into the part of Spain that was once the medieval Basque kingdom of Navarre. 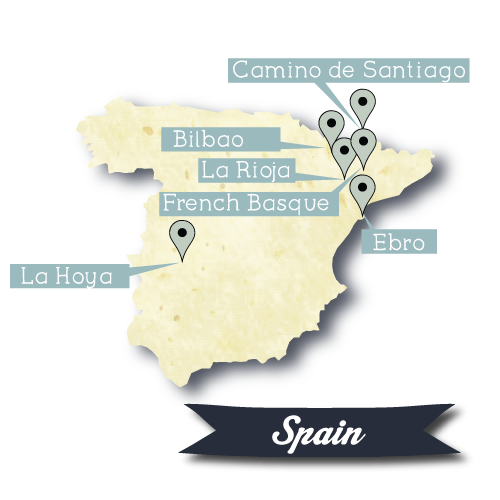 We’ll walk the Camino de Santiago—through mountains this time—and into the world-renowned La Rioja wine region. During these two days, we immerse ourselves in Rioja wine country, with visits to vineyards to learn the secrets of creating its full-bodied flavor. We’ll have a wine tasting in the vaulted cellars of medieval Laguardia. We’ll drink Rioja paired with everything from tapas to multi-course Basque feasts. 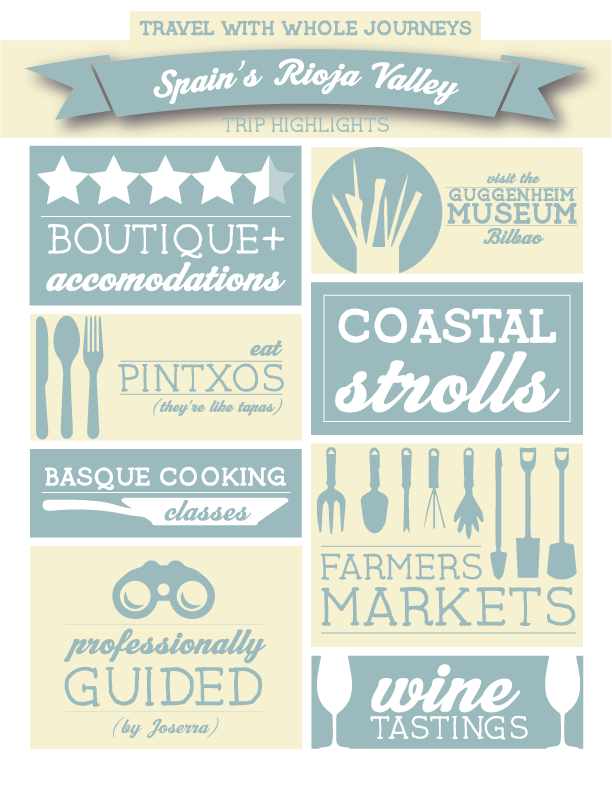 We’ll even join a chef for some hands-on cooking and prepare an unforgettable Basque dinner. 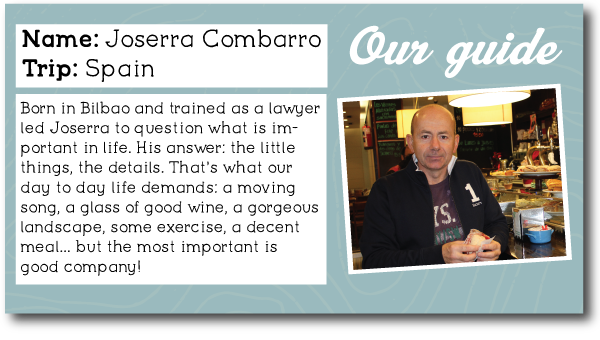 On the October trip, we’ll help harvest Rioja grapes and press the grapes with our bare feet. Before we leave Spain’s mountains, we’ll hike from pastoral valleys to the dramatic, mountaintop monastery of Arantzazu. The cliff-side sanctuary was built 500 years ago to commemorate the Virgin Mary’s appearance to a local shepherd. Later, we’ll drive across the green Atlantic valleys to the old whaling harbor of Lekeitio, where we’ll spend the next two nights. There, we’ll explore thefish market and watch boats unloading the morning’s fresh catch. Our Day 6 hike takes us from Lekeitio’s sandy beach upstream along the green banks of Lea River to the town of Aulesti for lunch at a Basque tavern. Our meals might include Basque dishes such as tortilla de bacalao (codfish omelet with herbs), marmitako (tuna soup with green peppers and potatoes), or lomo de merluza en salsa verde (hake in green sauce). In the morning, our group will transfer to the Bilbao Airport for your return home or to other destinations in northern Spain.